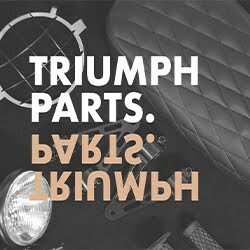 My name is Derick I am the owner, founder, and designer at VDBMOTO where we build uncomplicated, fun to drive motorcycles. 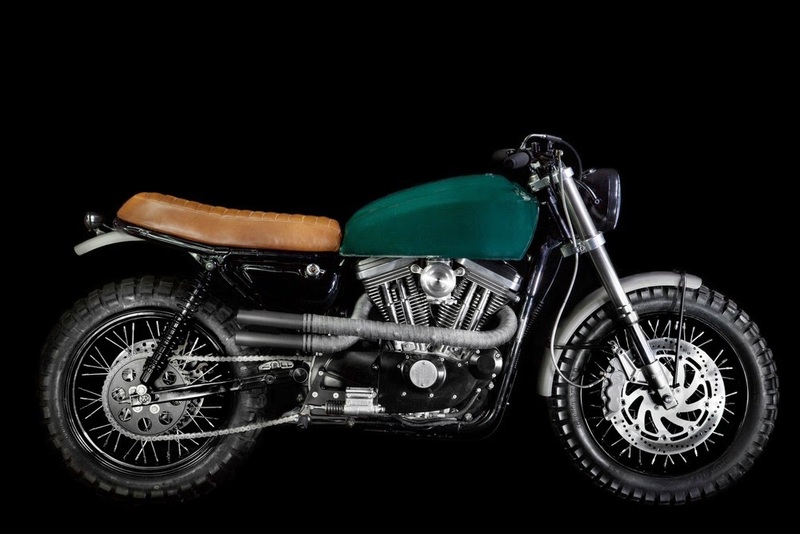 This is our first Harley project and it is based on a 99’ Sportster 1200. 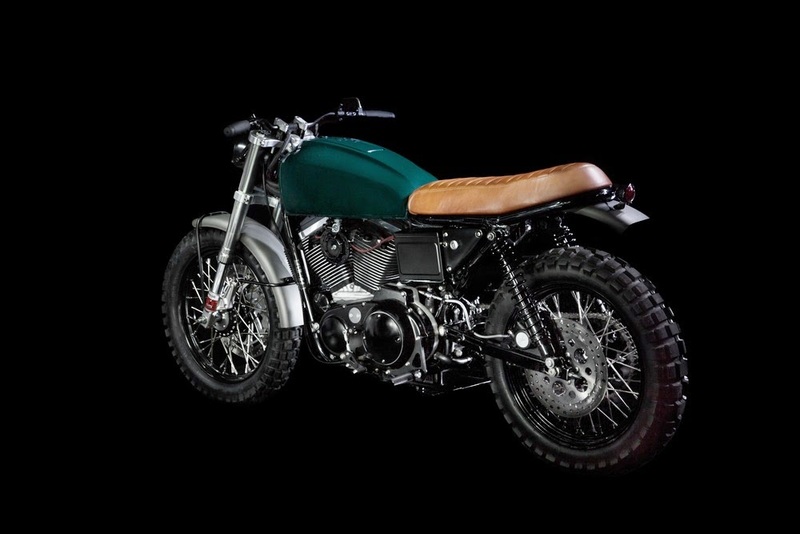 We wanted to achieve a retro look and transform it into something more versatile than the usual Harley. 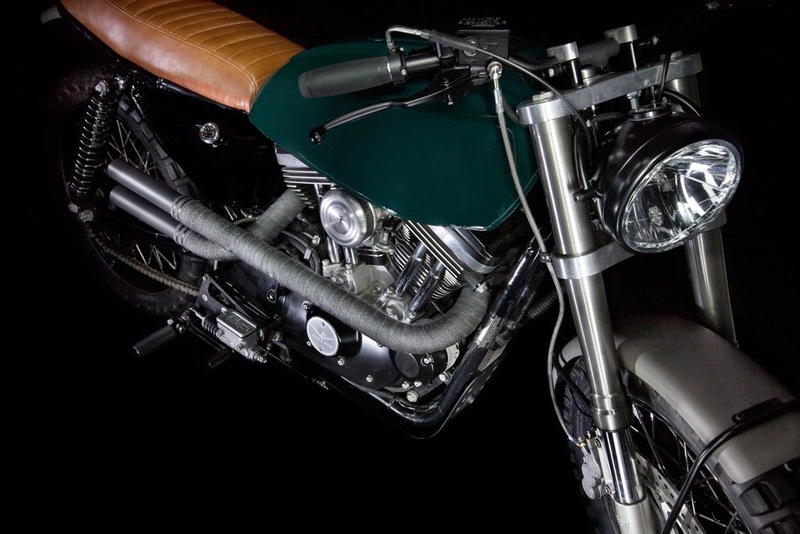 We always loved the American V twin and with the low-end torque engine we decided that this bike would be a great candidate for a scrambler conversion. The entire front end was ditched for a brand new set of Showa inverted forks attached to a set of custom aluminum triple trees made by our friend Mark at Crossroads Performance and increased stopping power given by a PM 6 pot caliper with a 13.5" rotor, while at the rear a pair of taller Progressive shocks lifts the back end. The original mag wheels were swapped for a set of 18” spokes front and back for more of a classic look, and mounted to the usual Conti TKC80 that all together helped leveling the bike and adds some general height. 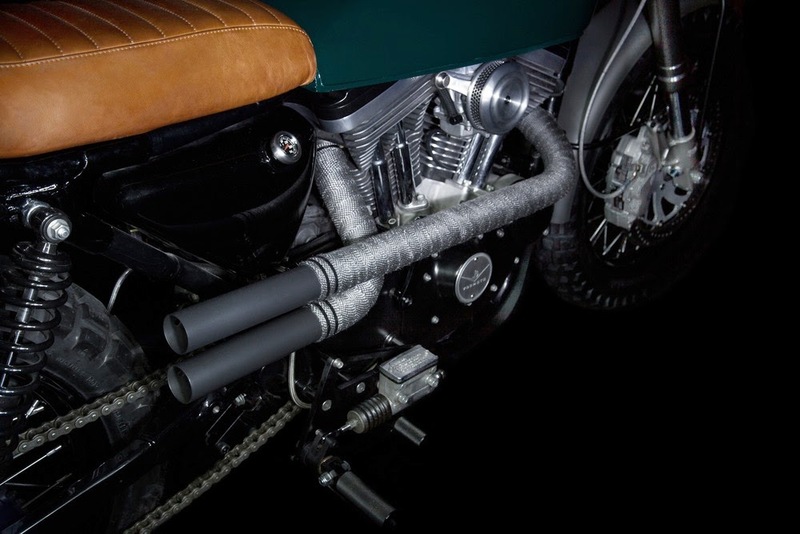 The engine breaths through a Boyle Custom air cleaner and in combination with the straight high pipes makes the V twin sound like a beast releasing the power through a chain in place of the original belt drive. Given the overall new stance and height the Chainsikle rear set is now providing a great riding position sitting 4” lower than the original set up flowing perfectly with the feel of the enduro bars. We wanted to keep the front end as clean as possible so the mini switches were wired inside the handlebars, while the motogadget speedometer is mounted in the headlight bucket, and micro LED indicators are attached to the bar mounts. The frame was shortened and a loop was welded with tabs for the rear indicators. 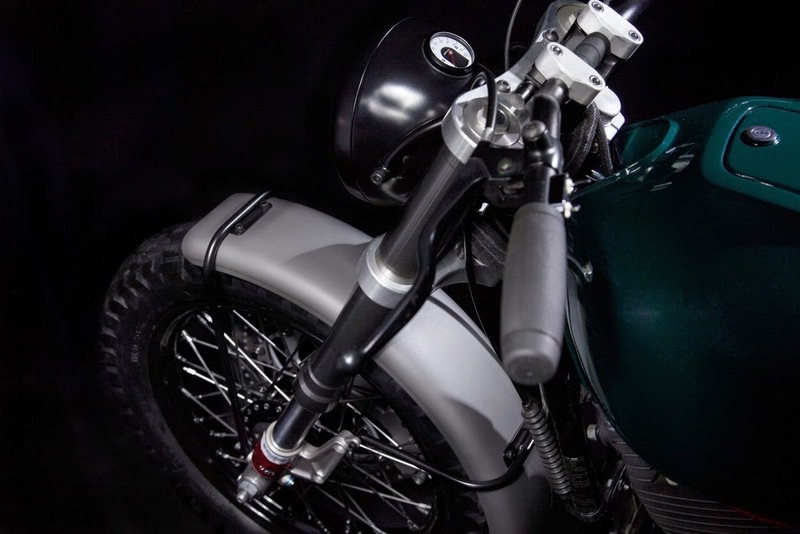 Brackets were fabricated to hold the steel fenders and headlight while an aluminum mudguard in the wheel well and a skid plate under the frame were made for added protection. The ignition key is now repositioned by the fuse box and a LED toggle acts as a kill switch next to it while the coil is now relocated in the battery box sporting a smaller ballistic unit. 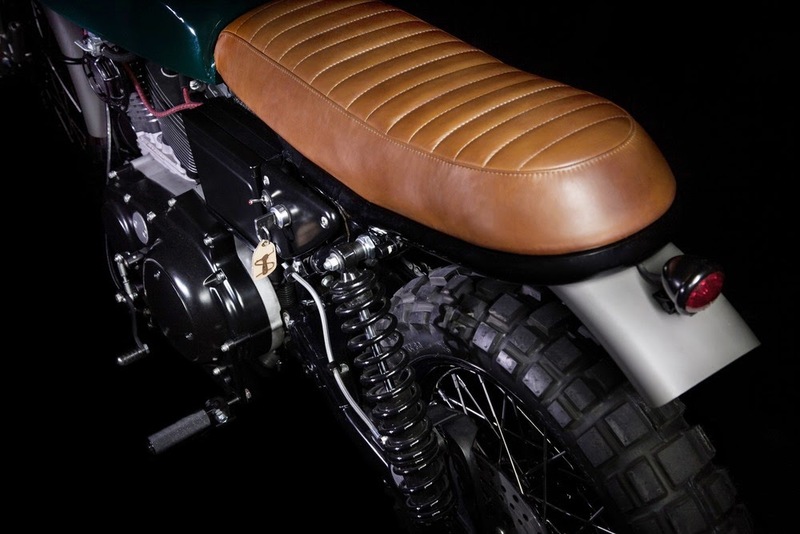 To finish the look we opted for a big old 77’ Hondamatic tank that was modified in order to fit the frame, then painted with a pastel Jaguar green that blends with the lines of the handmade brown ribbed leather seat. 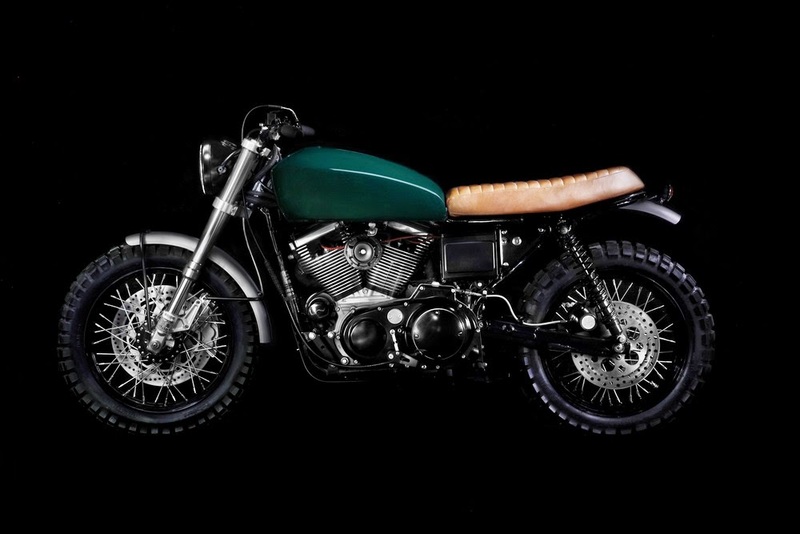 The result is a functional and fun to drive Sportster with classic lines that can take you in every road setting.